a person is killed due to the negligence or misconduct of another individual, company, or organization. The tragedy of a wrongful death can be devastating and overwhelming. Coping with such a loss can be the most trying time for a family. The grieving is made worse when the loss of a loved one is caused by the negligence or wrongful conduct of another. A wrongful death occurs when a person is killed due to the negligence or misconduct of another individual, company, or organization. Alabama law holds the view that human life is incapable of translation into a compensatory measurement and, therefore, Alabama is the only state in the nation that does not allow the surviving family members to recover compensatory damages for the loss of a loved one. Only punitive damages are recoverable in a wrongful death action, and the punitive damages recoverable are determined by the gravity of the wrong done, the punishment called for by the act of the wrongdoer and the need to deter similar wrongs in order to preserve human life. Since only punitive damages are recoverable, proof of out of pocket costs, medical expenses, emotional distress, physical suffering, loss of economic support and loss of the companionship of a child or spouse are deemed “irrelevant” because they are not recoverable elements of damages. The right to assert a claim for the wrongful death of a loved one depends on the individual circumstances. Where an adult is killed under circumstances not related to his or her employment, the personal representative of the decedent’s estate is the proper individual to assert the claim. In other words, under normal circumstances it is necessary to fist open an estate and have the right individual appointed by the probate court as the representative of the estate before commencing a wrongful death action; otherwise, the suit may be a nullity. Where a minor is killed, the mother or father of the minor may commence the wrongful death action without regard to an estate. 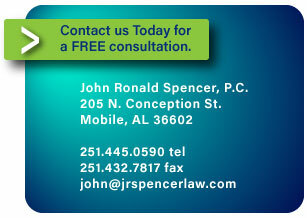 Where the death of a loved one occurs in a work accident, Alabama’s Workers’ Compensation Act provides that the deceased employee’s dependents may proceed against the employer to recover workers’ compensation benefits for the death of the employee –death benefits under the workers’ compensation Act, however, are capped. Another aspect of the wrongful death act that is unique to Alabama is that the proceeds (or recovery) in a wrongful death action are distributed pursuant to Alabama’s laws of distribution (that is, the laws that set forth the order and amounts in which an individual's estate is distributed when he or she has no will) but the proceeds of the wrongful death suit are not a part of the decedent’s estate and are not subject to any claims against the estate. Any death that results from the negligence or wrongful intentional acts of another is referred to as wrongful death. Wrongful death cases arise from a variety of circumstances, including motor vehicle crashes, medical malpractice, dangerous or defective products, workplace and job-related mishaps, and construction site accidents. I have successfully represented families of those that have lost a loved one due to the negligence or wantonness of another. During such a difficult time, you should not have to face a wrongdoer, corporation or insurance company alone.